With global concerns for ethical fashions after tragedies such as the collapse of the Rana Plaza sweatshop in 2013, the “Change Your Shoes” campaign hopes to shed light on another facet of the fashion industry- shoe production. An effort by 18 human rights, workers’ rights and environmental organizations from Europe, India Indonesia and China, the campaign hopes to transform the global shoe industry, fighting unsafe conditions, toxic exposure and poverty pay. Supporters can download the #ChangeYourShoes app and join a virtual march to Brussels, calling on the EU to adopt clear regulations that ensure transparency in the shoe supply chain. The global garment industry has been under a microscope in recent years, with both ethical and environmental issues coming to the forefront with sourcing and sweatshop stories regularly being a hot news topic. But what is often overlooked are the toxic and inhumane conditions that accompany the massive shoe making industry. Each year, an estimated 22 billion pairs of shoes are produced- equaling about three pairs of shoes per person! Around 87% of these shoes are produced in Asia alone, with little information passed along to consumers about the details of production. Unlike the fashion industry, the production of shoes remains somewhat untracked. But the reality of global shoe production is poverty pay, long hours, and unsafe conditions with repeated exposure to chemicals, dyes and chromium, which is used to treat leather and can cause cancer, blindness, eczema and asthma. #ChangeYourShoes is taking steps toward transparency in the shoe making industry, asking consumers to help them make the first step. With global concerns for ethical fashions after tragedies such as the collapse of the Rana Plaza sweatshop in 2013, the �Change Your Shoes� campaign hopes to shed light on another facet of the fashion industry- shoe production. An effort by 18 human rights, workers� rights and environmental organizations from Europe, India Indonesia and China, the campaign hopes to transform the global shoe industry, fighting unsafe conditions, toxic exposure and poverty pay. 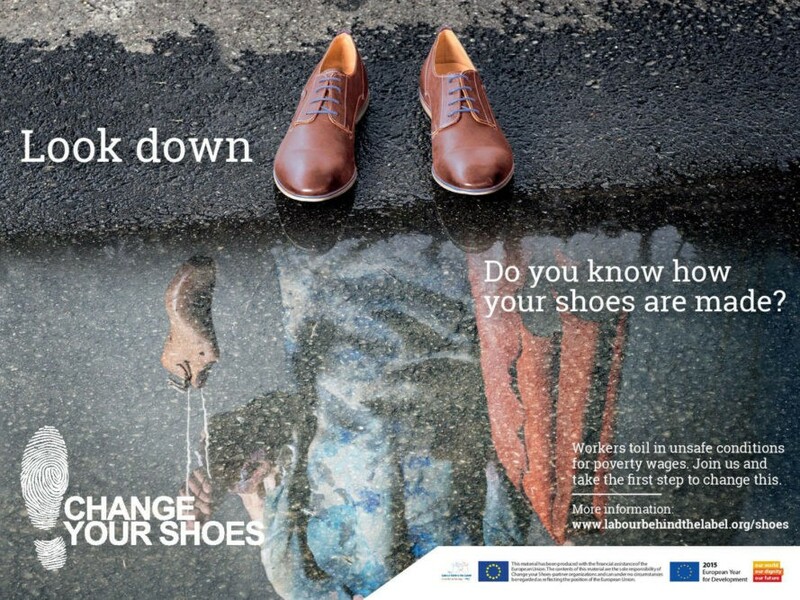 Supporters can download the #ChangeYourShoes app and join a virtual march to Brussels, calling on the EU to adopt clear regulations that ensure transparency in the shoe supply chain.